This is an era of computers, software and apps. We cannot imagine life without these. We do a lot of stuff online, these days such as booking tickets, mobile recharge, bill payment, bank transactions, booking a cab, shopping and the list goes on. Thousands of software and apps are being launched every day. You have thousands of websites and apps for doing the same thing. For example if you search for online shopping website, you will get thousands of them. But still not all of them are equally popular. Similarly you might have several apps for instant messaging, but not all of them are equally effective. The reason being that users prefer only those websites or apps that are good in quality. Here, by quality we mean responsiveness and user friendliness. There are various other such factors that contribute to the quality of software or an app. Software testing plays a great role in deciding the quality of a software or app. Testing is one of phase in entire software development life cycle. It is a very detailed process and it ensures that the software or app is behaving as expected and is free from defects. These days all the IT companies are paying a great attention to this part of software development life cycle. So, there is a vast career opportunity in the field of software testing. Companies have realized that no matter how good the development team is, the quality of software can only be maintained by having a good testing team as well. There are several companies who are looking for skilled resources for Software testing in Jaipur. Why Choose Software Testing Courses? Many career growth options including test lead, automation architect, project lead, test manager and manager. However, there are many institutes that offer Software testing course in Jaipur. But not all of them are providing the required study material or knowledge. So choose us, we are among the Best Software testing institutes in Jaipur. Recommended by Students as India’s Best software testing training, Course, Classes Provider in Mansarovar, Malviya Nagar, Triveni Nagar, Gopalpura Bypass Road and Vaishali Nagar, Jaipur! Do not wait anymore! Call Us @ +91 9672313999 to know more about software testing training in Jaipur. 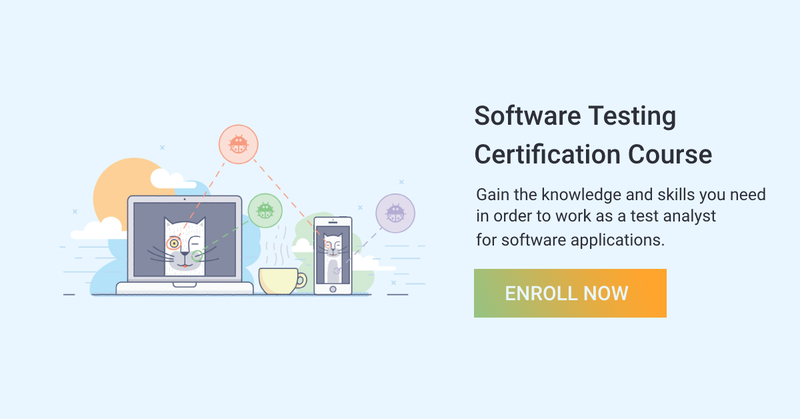 You can also contact us by submitting the Quick Enquiry form on the right side of this page to know more about the software testing training institute in Jaipur.